With the highest cure rate, Mohs micrographic surgery is the recommended treatment for basal cell and sqaumous cell skin cancers on the head and neck. In the hands of our fellowship-trained Mohs surgeon, we are confident that you are receiving the expertise that you deserve. 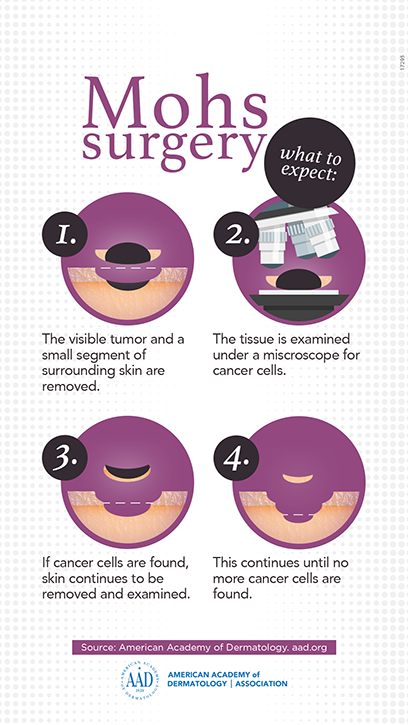 Mohs micrographic surgery treats skin cancer through a highly specialized and precise technique that removes the cancer in stages, one tissue layer at a time. Though the biopsy site may appear to be healing well at this time, definitive treatment is still recommended. Mohs surgery is a meticulous process that ensures that all the skin cancer cells (which often cannot be seen on the surface or with the naked eye) are removed. Tumors can grow back if these microscopic cells are not removed. Complete removal of the skin cancer confirmed by microscopic evaluation of the tissue. Tissue conservation. The tumor cells are meticulously tracked and removed, while leaving as much healthy surrounding tissue as possible. Every millimeter of normal tissue spared means smaller scars and better cosmetic and functional results. With the assurance that all of the tumor has been removed, your Mohs surgeon can confidently employ the full spectrum of reconstructive options to repair the area and provide the best cosmetic result.